We're Having Fun Keeping Our Trash Out of the Ocean! Trash in the ocean is a big deal these days mainly because our new materials don't readily degrade. Some trash like plastics don't degrade at all they just go micro size. And with 8 million metric tons of this trash flowing into the ocean every year, there are myriad developments to stop the flow, cleanup our shores and to get out what's afloat in the ocean. But what's the best action for you, your cleanup group or your community? Trash can only be truly understood in the light of the local community. 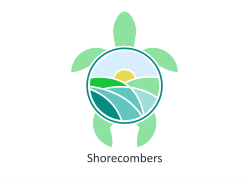 Let Shorecombers' help you find the perfect solution to keeping your trash out of our ocean. Inside this website you'll find information on our coursework, our brand new behavior change marketing program, and hiring us as consultants. If you don't see a solution for you, please drop us a line from our contact page. 80% of Trash in the Ocean (and Our Local Water Bodies) Originates on Land. It's the Trash You Step Over Every Day. What Will You Do About It? Ocean Hour on Your $10,000 Gulf Star Grant! Shorecombers Trash Blast Leader's Workshop Graduates Sharon Gincauskas and Barbara Mozur just received a $10,000 Gulf Star grant award from the Gulf of Mexico Alliance (GOMA)! The award is to help them collect more trash along their northwest Florida shorelines. They are training more cleanup captains so they can open more cleanup sites. They share data with Sea Grant scientists tracking what type of trash is most commonly found on the beaches. Knowing what is left behind helps to target education and policy programs to reduce the trash. Congratulations Limitless Vistas on Your $10,000 Gulf Star Grant! Limitless Vistas of New Orleans Louisiana won the Gulf of Mexico Alliance (GOMA) Education Team's Gulf Star Award for the state of Louisiana! There were only five awards given out. One for each of the Gulf States and our Florida Shorecombers team won the award for their state. 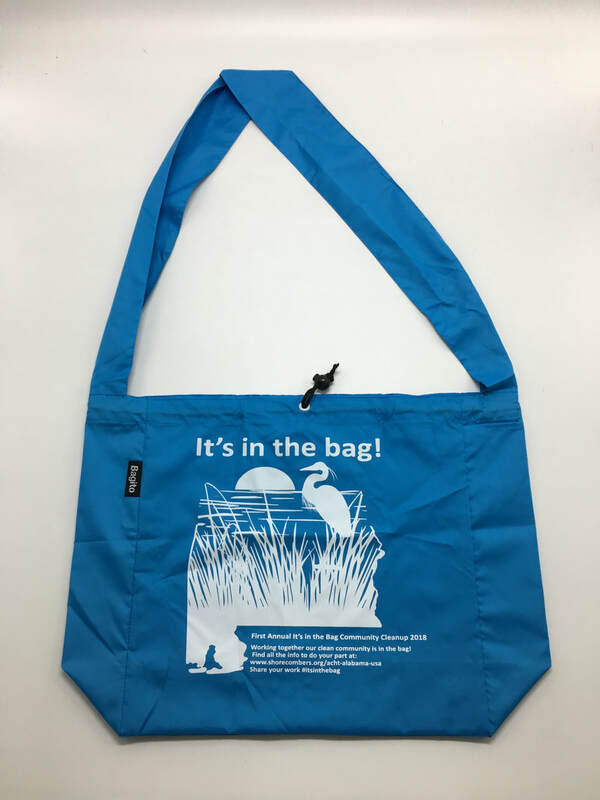 Join the Alabama ACHT It's in the Bag Campaign! The bags are here! We are building a campaign to spread the word that it is cool to pick up trash. Some great folks are already doing it, you might just be one of them. Millions of people world wide are getting out and making it a part of their day. As they walk the beach or the neighborhood, they are picking up trash because it is cool to be kind to nature. 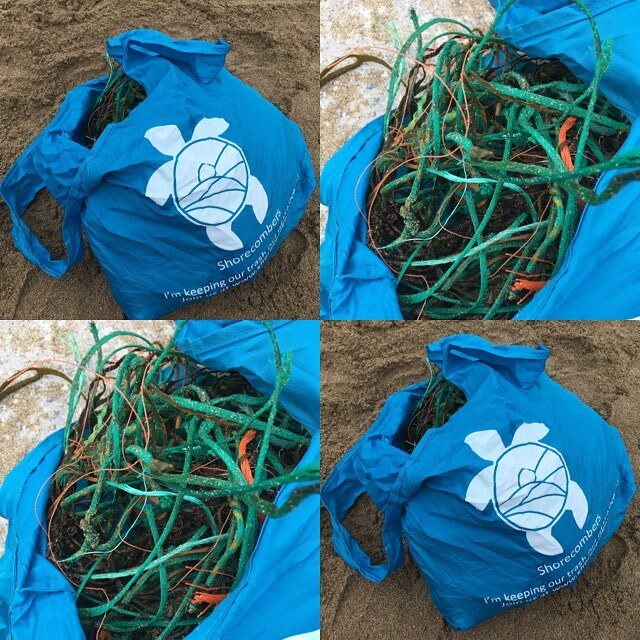 Kat Byles in Antigua joins "It's in the Bag"
Take a lead from Kat Byles of PR with Heart who picks up litter (rubbish) on her local Antigua beach and offers an online marketing course called PR with Heart. For each woman who joins, Kat will donate £50 ($65) to Shorecombers to keep more trash out of the ocean. I've learned a lot from Kat - mainly that working with your heart is easier than knocking your brains out! You can sign up here where you will also find all the course details: http://www.katbyles.com/products/pr-with-heart-online-course/ Let Kat know you came through Shorecombers.